As SB Shashank, the Chief Election Officer of Mizoram, decides to stay until he receives any order from the Election Commission of India, despite huge uproar from civil societies of Mizoram, the NGO Coordination Committee has reiterated that they would start ‘Save Mizoram Movement’ or ‘Mizo Hnam Hnatlang’ from Tuesday. A series of high level meetings to solve the election process deadlock were held in Aizawl on Monday but a solution to the turbulence is still a far cry. The Aizawl Deputy Commissioner has sought the help of the union of church leader – the Mizoram Kohhran Hruaitu Committee and held a series of meetings with top officials of the state. On condition of anonymity, one official, who attended these meetings, said top officials of the State persuaded CEO Shashank to leave Mizoram but all in vain. Meanwhile, the Central YMA has instructed all its district sub headquarters to ensure that from Tuesday, all election process should be put to a halt. “Unless the CEO leaves Mizoram and a new CEO is appointed the CYMA will organize a non-violent demonstration,” the CYMA stated. Chief Minister of Mizoram Lal Thanhawla also wrote to Prime Minister Narendra Modi to take stock of the situation in Mizoram and appoint a new CEO or relieve SB Shashank from his post. “All election preparations are in place and additional CEOs have all the technical know how,” Lal Thanhawla wrote. ‘Save Mizoram Movement’ or ‘Mizo Hnam Hnatlang’ will come into force from Tuesday, not only the civil societies but also student organizations, school associations have expressed their support. The Mizoram Independent Schools Association, to show their solidarity to the movement has decided to close all its member schools on Tuesday. 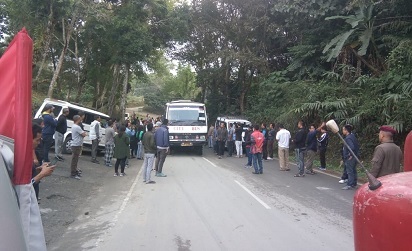 Meanwhile, vehicles bound for Assam to pick up 100 companies of central armed police forces were halted by YMA volunteers at Kolasib district. The upheaval started when SB Shashank, the CEO of Mizoram lodged a complaint against Mizoram’s Principal Secretary (Home) Lalnunmawia Chuaungo to the Election Commission of India which led to his ouster from his post. And further, despite Mizoram’s history of peaceful election the CEO, without any consultation with the Home Department of Mizoram, the CEO ordered deployment 100 companies of central armed police forces. His move is being seen by the civil societies as an attempt to set up polling stations at the Bru camps in Tripura, which has been opposed by all the NGOs of the State.